The first version of Disk Maestro was little more than operating system drivers and basic utilities, but we rapidly added functionality. Tcopy was a tape backup utility that supported SCSI tape drives. 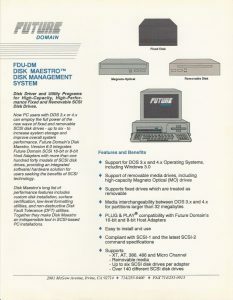 Disk drives became larger than the operating systems could handle so we added special formatting and testing software, along with BIOS enhancements. Our experience with Iomega taught us how to handle fixed disks as removable media at a time when DOS did not have the ability to perform this function. What is a SCSI Host Adapter?